The term ‘interview ‘ is dervied from latin language which means “see each other“. In general terms, interview is nothig but a formal meeting between a interviewer and and interviewing where questions are asked by former and answered by later. This process is mainly done to get to know each other and also to select and recruit the candidate for a job. According to Thill and Bovee, “An interview is any planed conversation with a specific purpose involving two or more people”. Interviewers have different styles and methods of interviewing. The main aim of the interviewer is to find out whether the candidate can act accordingly to different situations and circumstances. They try to extract the most information from the candidate so as to know the outcome of the interview. 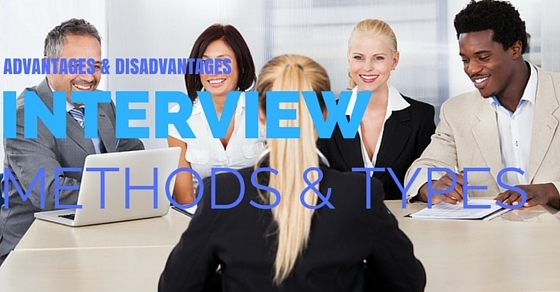 Following are the types of Interview methods widely used by the interviewers. Behavioural based interviews are based on the behaviour and the past experiences of the interviewer. It is also based on the past performance of the candidate. For such purposes, STAR based behavioural interviews are done. The STAR based behavioural interview questions consists of situations,task, action and result. These serves as a framework for describing different situations or tasks and defining the actions that you took and what the result obtained was. When stating such facts try to remember that the main purpose of such interviews is that they are trying to find an able leader who is optimistic, creative and a team player. Case questions are one of the most commonly used forms of interview methods. In this type of interview, the interviewer presents a scenario to the candidate and expects the candidate to solve the questions with a proper solution and an alternative method or further suggestions to the question. The candidate is tasked with working along the details. Case questions may vary depending upon the job position. In some cases, the interviewer tries to find a candidate that is suitable for implementing long term strategies and processes while in other cases, they tend to find candidates who are calm and composed in case of any emergency situations. They are expected to answer such case scenarios immediately. Since these kinds of questions take proper thinking and planning, these type of interviews are usually half an hour long. These types of interviews do not include any kind of performance pressures. These are basically used as a form of information for the candidate as a chance to compare their expectations about the job to the position that they have applied for. Candidates get the opportunity to speak with the current employees in the corresponding job position. They try to make this as a chance to carefully think about the position and try to search for its more positive and less positive aspects about the position. For example, if the candidate is interested in working in the publishing industry, try to meet up with fellow employees in the organization and learn more about the business. This helps both the employers and the employees at the same time to make proper decisions. Informational interviews are always less than half an hour. Both the employer and the employee should prepare questions beforehand, prior to the interview. The interview is an essential step in the recruiting process. The hiring procedure cannot be accomplished with out the interview. 1. Collecting data – both extensively and intensively. 2. Exchanging data and also the experiences. There are various types of interview method of data collection in qualitative research, including perceptions, literary or visual investigation and interviews. Be that as it may, the most widely recognized techniques used as a part of interviews and focus groups. The most common form of interview. These type of interviews include face to face conversation with the candidate and the interviewer. Though it is not as stressful and hectic as a group interview or a panel interview, candidates are still pressured to make a good impression to the interviewer. The output of the interview solely depends on the performance of the candidate. Candidates should try to make a statement to the interviewer and make them feel why he/she is most suitable for the position. Try to state various facts and achievements in a consistent manner and try to make a good impression to the employer. This also includes no bluffing. Do not try to bluff or tell lies about achievements and skill set. Describe what is only present in the resume itself and do not try to add anything more overwhelming. It is considered as the least common method of taking interviews because it defeats the whole idea of interviews. These types of interviews are very much contradictory to the normal style of interviews. Face to face meeting is not important in these type of interviews, but the interviewer checks on the verbal abilities and soft skill abilities of the candidate. They try to check for various verbal cues. Candidates should check for various changes in tones of the interviewer and try to express enthusiasm and excitement through voice modulation. Furthermore, candidates are advised to have a pen and paper during such interviews and try to note down the various points, questions and answers and try to keep track of the thought process. Always try to consider being called for a second interview as a good sign. It can be due to many reasons. One reason that could be a factor is that, your performance in the first interview was satisfactory, but the interviewer is getting time to select between you and the fellow candidates. Hence, to clear such doubts and make a definite decision, usually employers call for a second interview to finalize the shortlisted candidates. Another reason that could be a factor is that, maybe the candidate made an overall excellent impression to the employer, and this could raise some more questions about the candidate and the employer wants to clarify it before hiring the person. Regardless of what the reason could be, second interviews should be considered as a great opportunity to showcase your skills and prove that you are the right candidate for the job. Group or panel interviews are the most stressful type of interviews. Here, the candidates can be asked any type of questions from a group of people. The candidate should try to make a steady eye contact with the person asking the question and try to be as confident as possible while answering. Also, try to make an eye contact with the rest of the panel when answering a question. Also do not solely fix your gaze onto a single person, during the whole interview. This will create a bad impression for the rest of the panelists. Also, try to ask for more time for a question, if needed. Video interviews are like the advanced version of interview process. They are done through skype, Google hangouts, facetime. This video interview creates a certain level of professionalism while the interview is going on. Video interviews makes both the parties on either side to focus. Its quicker and cheaper when compared to face to face interviews. Can reach to long distance easily. Also can reject candidates in the beginning itself. Though there could happen few hindrances like background distraction, bad signal, another call coming in , and the wost part is that you cannot hide it, as you can both see each other. Assessment “days” are the special days which are utilized to interview large groups of candidates at a time, for a range of different skills. They are one of the effective way to screen candidates for longer period of time. It helps in minimising the legal risks and is also less disputable. You also get extra time to assess candidates. The competition among applicants will always be high. A structured interview method is possible to reach a large number of people at the same time. A representative sample is possible and questions and answers can be modeled on such samples and models. Questions can be structured and answered in a way that is easy for the candidates to answer. Hence, a clear perspective and opinion can be received. Less dependency on electronic recording devices. For example: face to face interviews. Moreover, it creates a very little room for any form of confusion or misinterpretation of the questions asked. Interview methods are more personal in nature. The candidates feel more confident in answering through such processes. These types of interviews always use a closed set of questions, hence they are limited in number. This can create a definite impression about the candidate and hence can be used as a reliable method for choosing the right candidate. Interview methods are great for creating quantitative data. Hence, they can be more flexible and can be applied to various other processes. Structured interviews are comparatively easier to conduct and analyse and since they are limited to a group of the population, they act as a great tool for conducting surveys and data collection. A large population base can be reached within a short period of time through various interview methods. Unstructured interview questions can be made more flexible and adaptive depending on the candidates answers. Unstructured interview questions can be used for creating qualitative data. This gives a chance to the respondent to frame the answers in their own words. This shows the employer how much the respondent knows about the whole situation. Interview methods also have a deeper validity and originality since the employer tries to probe through the candidate to get some valued remarks and information about what they think about the company and how a third person sees the company as. The respondent steers the course of the interview in case of structured and unstructured interview. Try to ask for clarification and other aspects before and allow the interviewee to steer the direction of the interview. Group interviews can make the candidate feel less awkward since they might feel more comfortable in talking in groups rather than conversing with a single person. Structured interviews are usually non flexible, and thus new questions are not usually asked since such interview patterns have a strict time to follow and have a certain time limit. Structured interviews create quantitative data and hence a lack of detail can be formed. This means the interviewer won’t know why a candidate behave this way. For unstructured or unplanned interviews, it is difficult to collect all the necessary data and analysis of such data will take time, since they are less specific and cover more areas and aspects of the subject. Employing interviewers and trainers can be expensive. This can lead to more capital spent by the company during recruitment process. A great way to tackle this is conducting surveys or sending out questionnaires to the target audience and the people to be interviewed. Certain skills may be needed to be probed and verified. In this case an interview is indispensable. Interviewers have to cross check the facts and try to make sure that the candidate is truly interested and is fully adaptable and talented enough to join the post. Another main disadvantage of interviews is the handling of the personal information of the candidates. They have to make sure the personal information of the candidates are kept safe and have to be ensured that they won’t be misused that easily. Group interviewees have to be made sure that they won’t disclose the private information of the candidate to others. Trust is the basic factor that needs to be seen by the company and the organisation should make sure that the recruiters are following the rules of privacy set by the organisation. Group interviews tend to use more open minded questions that can deviate the interview from its path and hence can lead to more loss in time. This also makes them difficult to repeat the questions to the next candidate. Hence, the interview process tends to be more biased. Group interviews may tend to lack validity as the candidates may lie to the panel so as to impress them. This can be because of the peer pressure and the desire to get the job position. Always try to cross check if all the answers are true and try to point out if you feel unsure about the candidate’s response. This helps the interview panel to select the right candidate. 1. Try to fix whether the interview is structured, unstructured or group interviews. 2. The next step is to determine who will be the interviewer. This depends on who is going to be interviewed. This depends on what basis the interview is taking place and for what position is the interview for. This confirms what kind of a person the company is looking for the job. This defines the personality of the candidate. This is very important for jobs which requires teamwork on a day to day basis. Also it shows how the interviewer carries themselves through the clothes that they wear and so on. Some type of interviewers have problems interviewing people of different ethnicity. This may be due to language problems or cultural differences.